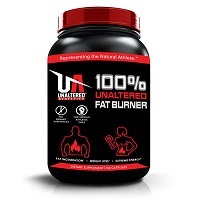 Unaltered Fat Burner is a non-prescription fat burning supplement designed to help dieters to burn through body fat faster than they would through diet and exercise alone. This product is manufactured by Unaltered Athletics. That company manufactures its products in the United States. It was founded by a father-son team of bodybuilders. This product is meant to boost fat burning for bodybuilders but is also used by people who are seeking weight loss by reducing their body fat levels. This supplement is sold in the form of capsules and is marketed to both men and women. The bottle promises fat burning, extreme energy and weight loss. That said, the official webpage for the product on the Unaltered Athletics website also claims that the product will raise the metabolism and suppress the appetite. It states that Unaltered Fat Burner is free of any banned substances, has been third party tested and is manufactured in a cGMP facility. At the time this review was written, the Unaltered Fat Burner ingredients were: L-carnitine, coleus forskohlii, yohimbe and green tea extract. These are all very common ingredients in fat burning and bodybuilding products. On a very positive note from this company, they went so far as to provide the precise amount of each ingredient that can be found in these pills. That makes it far easier for consumers to be able to compare the amounts to those used in any research conducted on the substances. It’s unfortunate that no research has been cited for either the Unaltered Fat Burner formula as a whole or for the individual ingredients. There is some research published on each of those ingredients in varying degrees of support and value. Overall, there are some studies to suggest that these ingredients may be advantageous to people who want to lose weight, though not to the point that any are considered to be proven. Interestingly, though many studies that research the impact of green tea extract use daily doses of 500 mg, though the developers of this formula chose to include only 400 mg. It is unclear as to why that amount was selected. This doesn’t necessarily mean that the formula contains too little green tea extract. That said, it is unclear as to why that specific amount was chosen. It is a very good idea to consult with a doctor before using this product for the first time or before using it again after having ceased its use for a while. Moderator on IonaminThank you for your interest in our products. We suggest you try Phentramin-D capsules, which offer similar benefits to Ionamin.